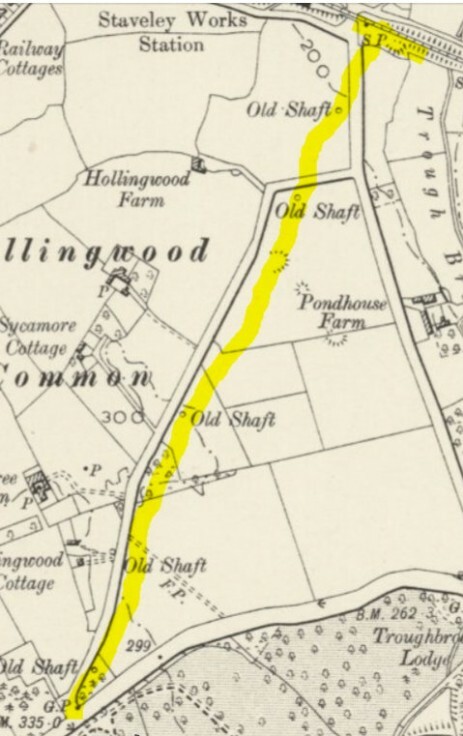 'The Hollingwood Common Canal is a tunnel one and threequarter mile long, and not connecting with the Chesterfield Canal but kept one foot lower by means of a culvert under the canal. The whole of its length except the first three hundred yards is driven in the Deep End or Squires seam. It is used for draining and working the coal seam and two others near to it produces good coking coals for the Nottinghamshire and Lincolnshire market At its southern end it is about eighty yards from the surface. The tunnel is six foot high, five feet nine inches wide with two foot of water The boats are twenty one foot long, three feet six inches wide and hold seven cones or boxes containing twenty to twenty two hundredweight of coal each. When the tunnel boats arrive at the side of the canal a crane is used to hoist up these boxes and empty the contents into a canal boat Canal barges on the Chesterfield canal for the conveyance of coal were seventy foot long seven feet wide and capable of holding twenty tons of coal. Near to the middle of the tunnel there are sixty eight yards driven through a grit stone. without the arching being held up by bricks as it is in other places along its length. This curious colliery belongs to his Grace the Duke of Devonshire on his own account under the direction of Mr. George Dickens his colliery agent'. The colliery was said to have been worked over its initial period by the Smiths of Chesterfield and also by Barrows company who built their works at the side of this colliery later in the century. Some of the coal was sold as house coal and good house coal was said to be a blend of two thirds soft coal and one third hard coal and customers expected it to be blended at the colliery prior to delivery. The colliery was ventilated by seven air shafts along the shallow length from the Chesterfield Canal to the top of Private Drive, one such shaft surviving at the top of Private Drive Hollingwood, the southerly end of the canal finishing after passing the site of Westwood colliery. The mine worked ironstone initially but was mining coal when Farey visited it in 1799-1800. In 1991 opencast operations were being carried out near to Staveley works and the Hollingwood Common Canal SK 47/57 417747, the contractors were to be responsible for the cleaning up of the Chesterfield canal and the Brimington bypass once again seemed likely to be built but the issue of building a road over an underground canal seemed likely to have its problems and so the tunnel was to be opened up and explored to see if it was safe to take the road over it. On a visit to the site I spoke to the site foreman who was trying to find the location of the tunnel entrance. We worked out where we thought it might be and to my delight the following week the site had been excavated and two tunnels were exposed. Our guess was spot on and so was John Fareys description from 1811. 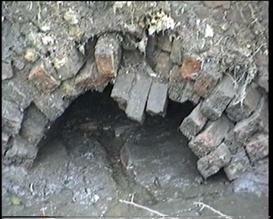 The tunnel is double brick lined with several bricks marked 'Hardwick' which may be later additions when the ends of the tunnel were sealed, the tunnel is impassable because of a build up of silt to about five or six inches from the top with a small stream running on top of the silt and only a few inches of air space left on top of the water. The second tunnel would appear to be a siding to store the empty boats in for the return journey. So all the empty barges travelled up to the other end together. The barges would possibly have been peddled up and down the tunnel by the miners laying on their backs and pushing on the roof. It must be noted that the original path of the Chesterfield canal has twice been altered since the underground canal has been abandoned. 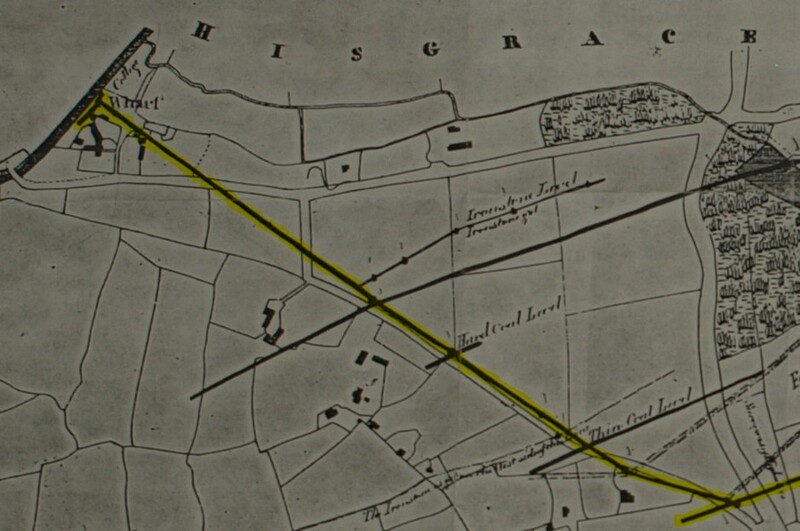 The underground canal shown on the map extends further from its southern end in a south easterly direction and is not shown on these maps.